To better grasp just how much human conditions have improved only over the past two hundred years, consider the following summation, which imagines humanity as just a hundred people. Imagine if you were surrounded by abject poverty and misery, but only years later find most people lifted out of deprivation and living comfortable lives; imagine nearly half of all the kids around you dying before their fifth birthday, but over the span of just a couple of years, such tragedies are virtually unheard of. When you consider that these conditions were the norm for most of our 200,000 year history, and that only in the last two centuries — a relatively small blip in the timescale — have they reversed so rapidly, it is astounding how so many of us fail to realize how incredibly far our species has come. 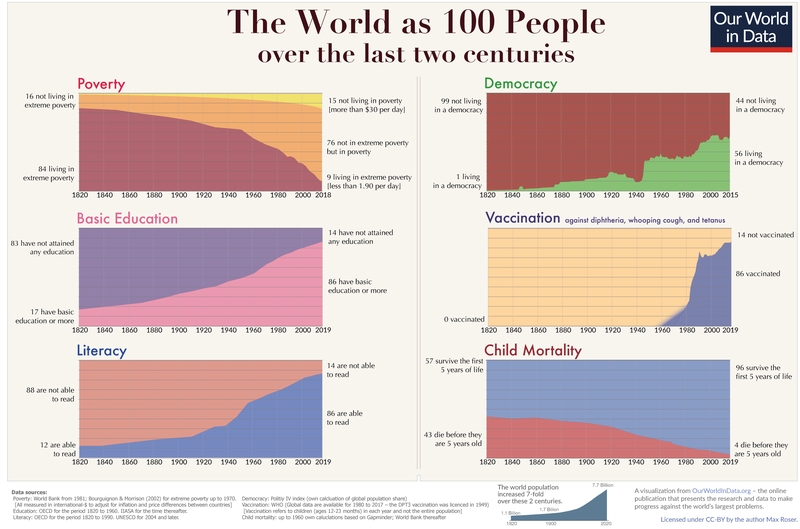 Learn more about human progress from the source of this infographic. While too many people still struggle with deprivation and abject poverty worldwide, it is crucial to acknowledge just how far humanity has come in this regard. 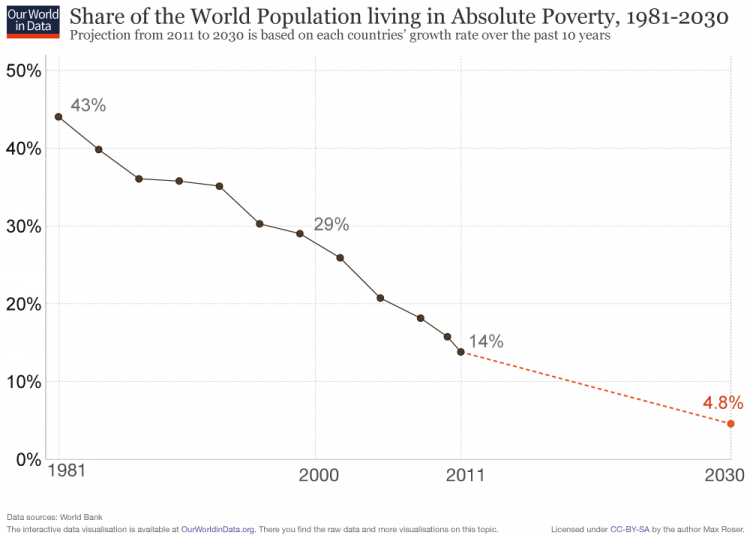 Over at OurWorldInData.org, Esteban Ortiz-Ospina and Max Roser have put together an extensive, data-rich report on world poverty, and the results are outstanding to behold: in less than 200 years, our species has halved the rate of overall poverty while reducing the most extreme forms of it to a fourth of what it once was. Poverty has declined not only proportionally, but in absolute numbers: in 1820, the world’s population was just under 1.1 billion, of which more than 1 billion lived in extreme poverty — defined by the World Bank as living on less than $1.90 a day. As of 2015, there were more than 7.3 billion people on Earth, of which 705 million live in extreme poverty. In other words, despite a seven-fold growth in population, there are fewer poor people now than two centuries ago, when the world was much smaller. Granted, progress in poverty reduction remains highly uneven: while Asia is no longer home to the most abjectly poor people, Africa has taken its place with the largest number and percentage of people in extreme poverty, at 383 million (although this is far fewer than the over 1.4 billion people living in extreme poverty in Asia and the Pacific in 1990). And the Asia-Pacific region is still close behind with 327 million people struggling with dire poverty. Nevertheless, most of the countries still struggling with high rates of poverty have still seen some progress over the years, even if it has been slow and at times sporadic. The gains may be tenuous, but they’re still there, and there are more than enough encouraging examples of previously poor nations making incredible strides over the last several decades (South Korea, Singapore, Ghana, etc.). Indeed, if we assume that the current rate of poverty decline continues, the number of extremely poor people will decline by more than half by 2030. If you’re interested in learning more about the above data, including methodology, data quality, and the definition of terms, click here. Like most Americans, I never gave much thought to lotteries. They were just an amusing, unlikely way to get rich at the cost of a only few bucks and some minutes filling out tickets. Over at Everyday Feminism, Sara Whitestone wrote an excellent piece addressing how best to respond to panhandling, a sadly common experience in our daily lives that is usually met with indifference, discomfort, and sometimes even hostility. All too often, the world’s poorest denizens are dealt the added blow of being invisible to their wealthier neighbors, governments, and even many of the humanitarian groups keen on helping them. Furthering worsening the plight of the poor, according to Claire Melamed of Aeon, is the shocking lack of information about what they think, feel, and experience everyday. Without these data, it is more difficult to connect to the human side of poverty, let alone to devise evidence-based solutions to alleviating it. The World Bank recently did a brave and very revealing piece of research. They asked their own staff to what extent they imagined poorer and richer people in three countries would agree with the statement: ‘What happens to me in the future mostly depends on me’. Bank staff predicted that around 20 per cent of poor people would agree with the statement. In fact, more than 80 per cent of poor people felt that what happened to them in the future depended on their own efforts – four times as many as the World Bank staff had predicted, and about the same proportion as richer people. It’s worth letting that sink in. Here we have staff in one of the most powerful development agencies in the world, freely assuming that the people whom they are employed to work with, and for, feel passive and helpless when in fact the opposite is the case. To add further insult to the many injuries of poverty, those struggling to get by often face the heavy stigma of being perceived as lazy, irresponsible, and even immoral. Being poor is a less a product of bad circumstances and environmental factors, and more the result of stupidity, ill-discipline, and personal failing. But as the New Republic reports, various studies are finding that the very nature of poverty makes seemingly irrational decisions perfectly reasonable. The very definition of self-control is choosing behaviors that favor long-term outcomes over short-term rewards, but poverty can force people to live in a permanent now. Worrying about tomorrow can be a luxury if you don’t know how you’ll survive today. Research supports this idea by showing that poor people understandably have an increased focus on the present. People who are among the poorest one-fifth of Americans tend to spend their money on immediate needs such as food, utilities and housing, all of which have gotten more expensive. In this situation, the traditional definition of self-control doesn’t make a lot of sense. Working toward future rewards also requires trust that those rewards will be waiting for you when you get there. To shed light on this we can look at the the classic experiment about self-control–the “marshmallow game”. Researchers use this experiment to measure how well children can delay gratification. They put one marshmallow on a table and tell a child that she can eat the marshmallow in front of her, or wait a while and the experimenter will bring her two marshmallows. It turns out that children don’t wait as long for a promised larger reward if they first learned that the experimenter was unreliable compared to other children who played with a reliable experimenter. And, of course, instability and unpredicability are hallmarks of life in poverty. People who grow up in poverty quickly learn that it doesn’t pay off to save for an uncertain future if the reward they are waiting for sometimes isn’t there after the wait. Indeed, if you don’t see a future, why bother saving or investing what little income you could spare, if any. The harsh and uncompromising demands of poverty make it so that short-term considerations are practically all that matter. In our society, hardly anything is more adverse to survival than poverty. It would be foolish to spend precious mental resources thinking about solving a problem that won’t occur for a month when you can’t afford dinner tonight. A series of studies in 2013 on scarcity among people in the lab and farmers in the real world found that being deprived of money caused the equivalent of a 13-point drop in IQ. That kind of a handicap will make it hard for anyone to engage in the high-level thinking required for self-control. Like any other kind of thinking, self-control can be taught. Children do better at self-control (and in school) when their parents teach them to solve problems independently and to participate in family decisions. But that kind of involved parenting takes time, and financially poor parents are often “time-poor”, too. Family factors, like nurturing and stimulation, are directly linked to mental development and can be limited by time poverty. And parents living in poor, dangerous neighborhoods don’t give their children as much autonomy as parents who live in less dangerous neighborhoods. This doesn’t mean that poor working parents aren’t choosing to teach their kids self-control. It means they may be prevented from teaching self-control to their children. Needless to say, poverty creates dire conditions for impressionable and developing minds. Poverty’s capacity to embed itself into the minds of young people is perhaps what is most pernicious, as perpetuates the psychological and physical consequences for generations. A child born in the bottom fifth of the income distribution has less than a one-in-10 chance of moving to the top fifth, and even the brightest poor children are still less likely to complete college than average wealthy children. Evidence supports the commonsense conclusion that children in poverty have little reason to have high self-efficacy about self-control based on observing those around them. Working out of poverty is an uphill struggle. The extra work required of people at the bottom to move up takes its toll on health. Poor children who succeed in school and life, particularly members of minority groups, often have worse health than those who fail, showing at least a 20 percent increase in a biological measure of heart disease risk. A recent study found that adolescents from poor backgrounds with higher self-control did better psychologically but actually aged faster at the molecular level than those with lower self-control. Self-control and achievement require poor people to overcome a number of structural barriers and obstacles. This is stressful, and stress takes a toll on health. Navigating this difficult terrain causes wear and tear on key parts of the body such as the immune system and ultimately deteriorates health. With all this mind, the article rightly points out the need to change how we frame the issue of self-discipline in the context of poverty. We tend to think that focusing on long-term goals is always a good thing and satisfying short-term needs is always a bad thing; we say that “self-control failure” is equivalent to focusing on the near term. This definition works well for people who have the luxury of time and money to meet their basic needs and have resources left over to plan for the future. But self-control as currently defined might not even apply to people living in the permanent now. Meanwhile, an article in the New York Times tackles the equally pervasive myth that the poor, being so weak-willed and negligent, are susceptible to further laziness and degradation when given assistance. So not only do the poor face ostracization and shame for their condition, but they are deprived of any help for reasons of weak character. Abhijit Banerjee, a director of the Poverty Action Lab at the Massachusetts Institute of Technology, released a paper with three colleagues last week that carefully assessed the effects of seven cash-transfer programs in Mexico, Morocco, Honduras, Nicaragua, the Philippines and Indonesia. It found “no systematic evidence that cash transfer programs discourage work”. So across widely distinct cultures and societies, handouts generally have no ill effect on work ethic or financial responsibility. Nevertheless, the myth of the corruptible poor remains widespread, if not intensifying. The culprit? Professor Banerjee suggests the spread of welfare aversion around the world might be an American confection. “Many governments have economic advisers with degrees from the United States who share the same ideology”, he said. “Ideology is much more pervasive than the facts”. Some would argue that the U.S. is a different story, because we host certain ethnic, social, and cultural groups that are more prone to laziness than other societies. But decades of evidence from domestic welfare programs do not justify this hypothesis. Already in 1995, an analysis of rates of birth to unwed mothers by Hilary Hoynes of the University of California, Berkeley, found that welfare payments did not increase single motherhood. And the experience over the next 20 years suggested that ending welfare did not reduce it. “There is some disincentive effect consistent with theory, but the economic magnitude is not large”, said James P. Ziliak, head of the Center for Poverty Research at the University of Kentucky. “Oftentimes these disincentive effects are overstated in the policy discourse”. Yet still these negative impressions of the poor — and the subsequent disapproval and gutting of aid — persists to punishing effect. Even when economic circumstances plummeted and people found themselves unemployed and financially unstable through no fault of their own, this already-baseless line of thinking persisted. When the Great Recession struck, many of the poorest Americans found there was no safety net for them. “Extreme poverty was more affected by the shock to the labor market than in prior experience”, said Professor Hoynes at Berkeley. The old welfare strategy … blamed for so many social ills died long ago. Its replacement is tiny by comparison, providing cash to only about a quarter of poor families and typically only enough to take them a quarter of the way out of poverty. As long as we fail to accept the external and structural causes of poverty, in favor of blaming and shaming the poor themselves, the scourge of poverty, and its subsequent sociopolitical consequences, will continue for generations, squandering millions of lives in the process. Over at The Atlantic, Barbara Ehrenreich reminds us of just how burdensome poverty can be. One would think this is obvious, but far too many Americans prescribe to the notion that poverty is a product of bad behavior and character, rather than the natural outcome of bad circumstances, such as a dearth of well-paying jobs. What I discovered is that in many ways, these [low paying] jobs are a trap: They pay so little that you cannot accumulate even a couple of hundred dollars to help you make the transition to a better-paying job. They often give you no control over your work schedule, making it impossible to arrange for child care or take a second job. And in many of these jobs, even young women soon begin to experience the physical deterioration—especially knee and back problems—that can bring a painful end to their work life. Most private-sector employers offer no sick days, and many will fire a person who misses a day of work, even to stay home with a sick child. A nonfunctioning car can also mean lost pay and sudden expenses. A broken headlight invites a ticket, plus a fine greater than the cost of a new headlight, and possible court costs. If a creditor decides to get nasty, a court summons may be issued, often leading to an arrest warrant. No amount of training in financial literacy can prepare someone for such exigencies—or make up for an income that is impossibly low to start with. Instead of treating low-wage mothers as the struggling heroines they are, our political culture still tends to view them as miscreants and contributors to the “cycle of poverty”.